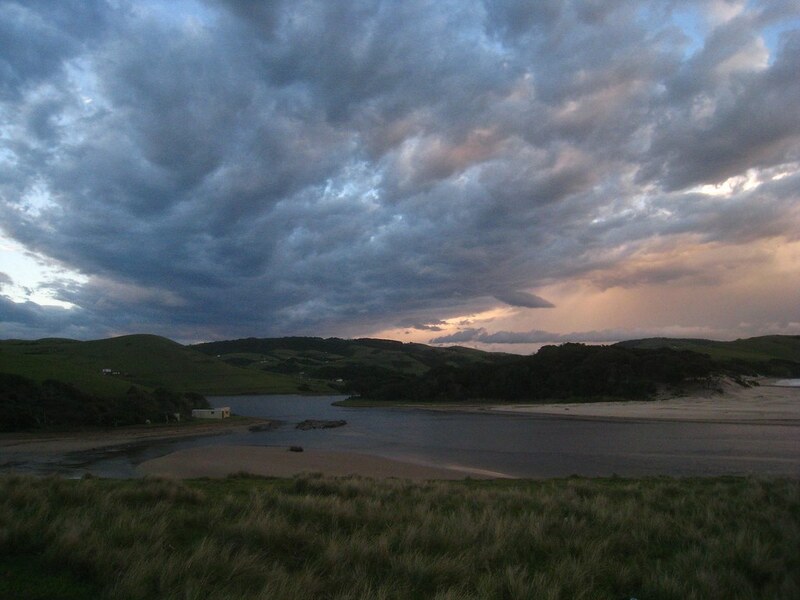 Bulungula Lodge is situated amidst the rugged landscape of South Africa's Wild Coast. 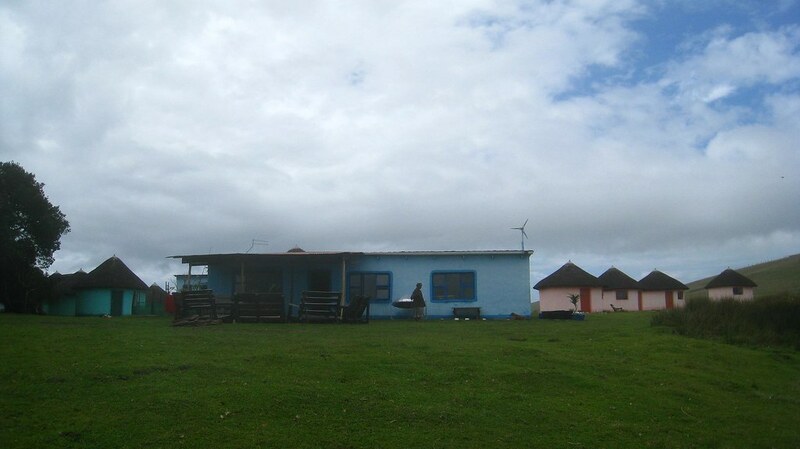 It was built adjacent a Xhosa village, with the villagers owning a 40% stake in the Lodge. 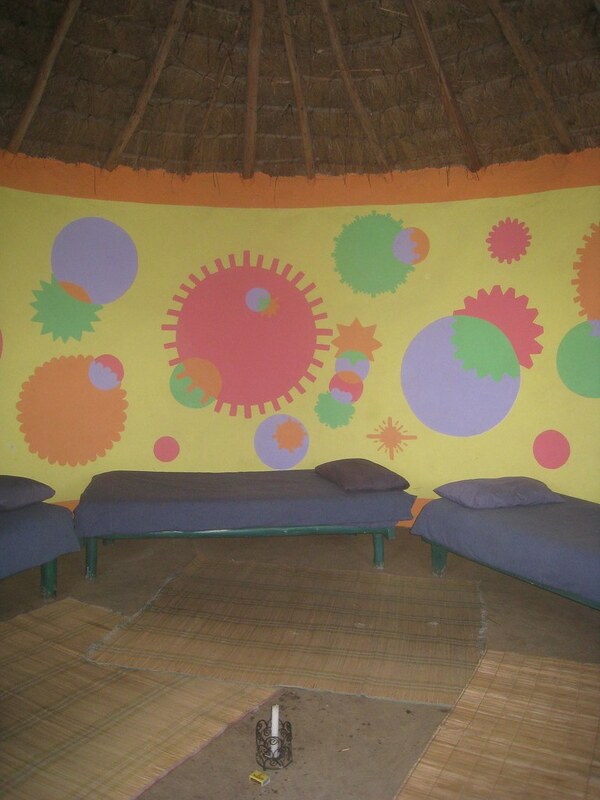 Guest accommodations are in the form of traditional African rondavels. 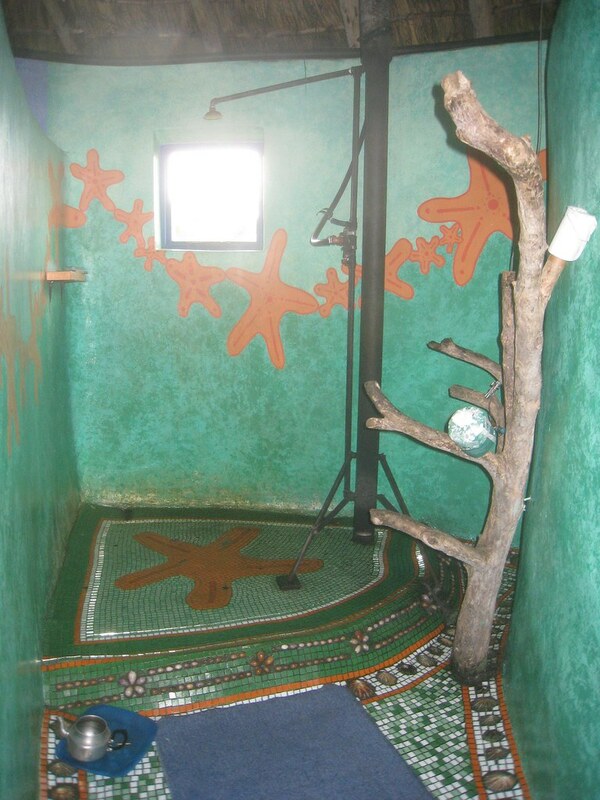 And a variety of eco-friendly facilities are employed to ensure minimal impact on the surrounding land and culture. Bulungula Lodge isn't easy to get to, but if you have the time, it's worth a few nights in your South African itinerary to experience this one of a kind backpacker lodge. 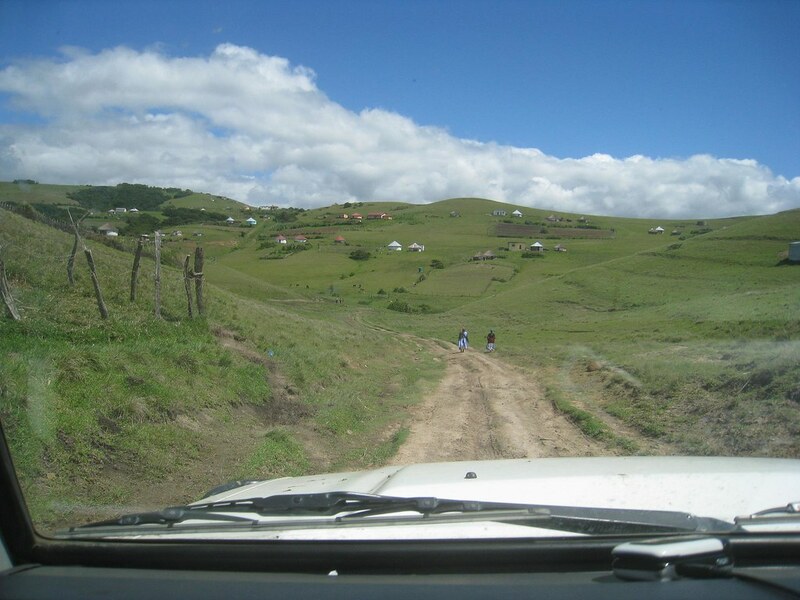 As you get closer to Bulungula Lodge, paved roads turn to rock and mud, and eventually plain grass. 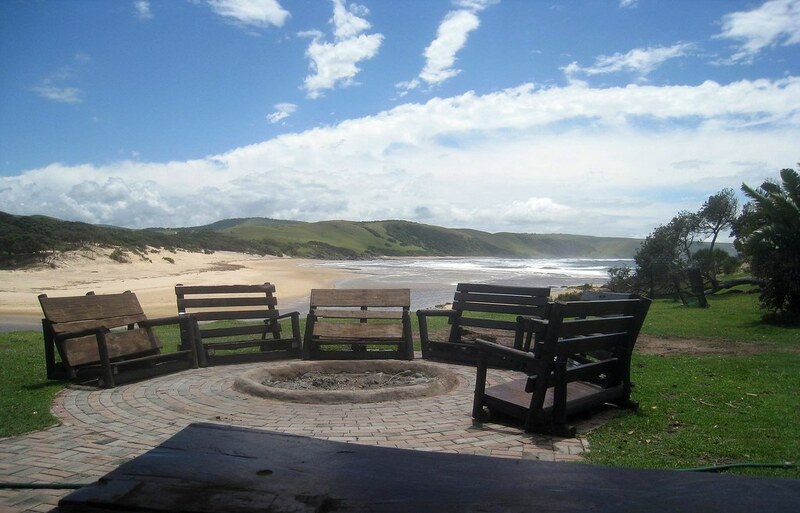 Bulungula Lodge is built with a low profile, and the guest accommodations are in the form of rondavels, the traditional Xhosa style 1-room homes. The rondavels are made of mud blocks and thatched roofs. 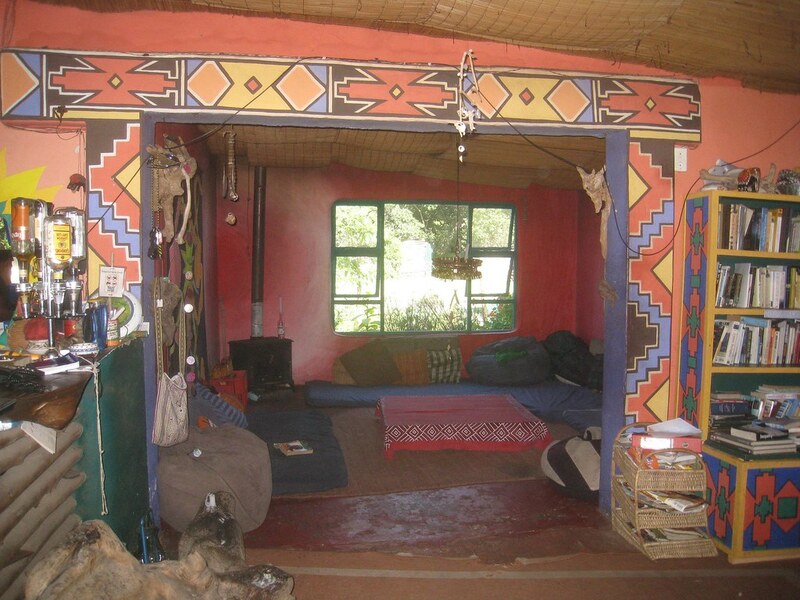 The interiors are brightly painted, and without electricity, candles are the only source of light at night. 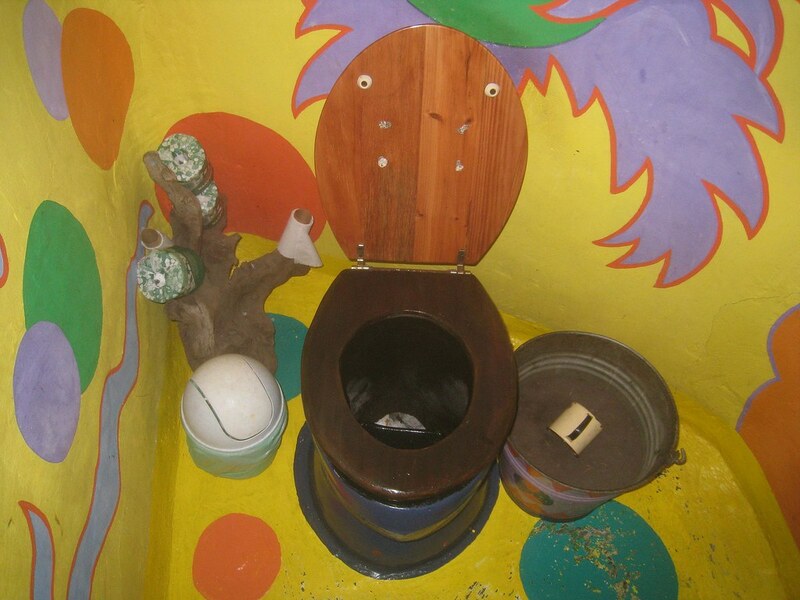 Composting toilets require you pee in the front section of the toilet bow, while depositing the rest down the back side. After your done with #2, drop a few cups of the composting soil on top of your deposit. In order to provide hot water showers, despite the lack of electricity, Bulungula Lodge provides paraffin wax "rocket" showers. Pour some of the melted wax in the teapot into the base of the black shower pipe, stick a few sheets of toilet paper into the wax, and then light it like a candle wick. Once the wax catches on fire, turn on the water, and the steam will heat it up. A fire pit outside the lodge is the perfect place for a nighttime drum circle. Inside Bulungula Lodge are comfortable common areas for hanging out and eating the communal meals, a library, bar, and kitchen. 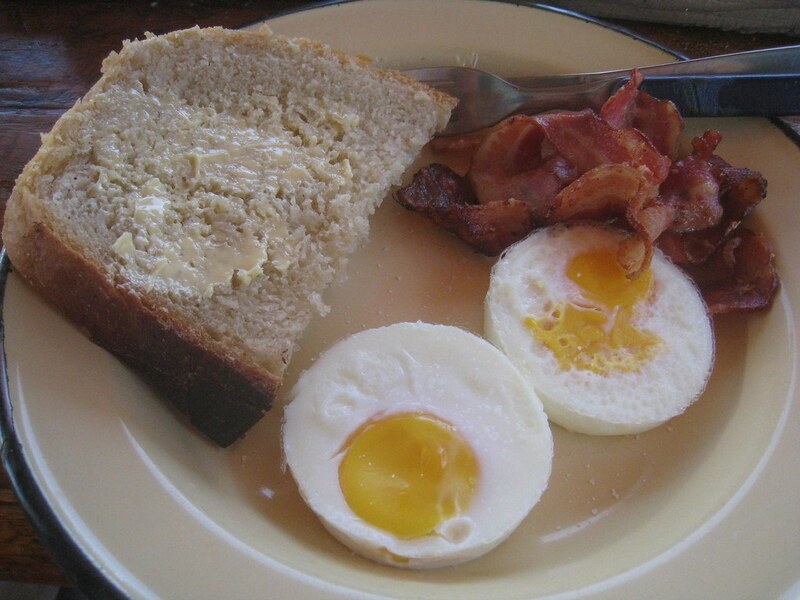 Breakfast at Bulungula includes Xhosa-style bread made using solar power, eggs, and hearty slices of bacon. Sunset view from Bulungula, taken after returning from an afternoon tour of the local Xhoxa village a short walk away. 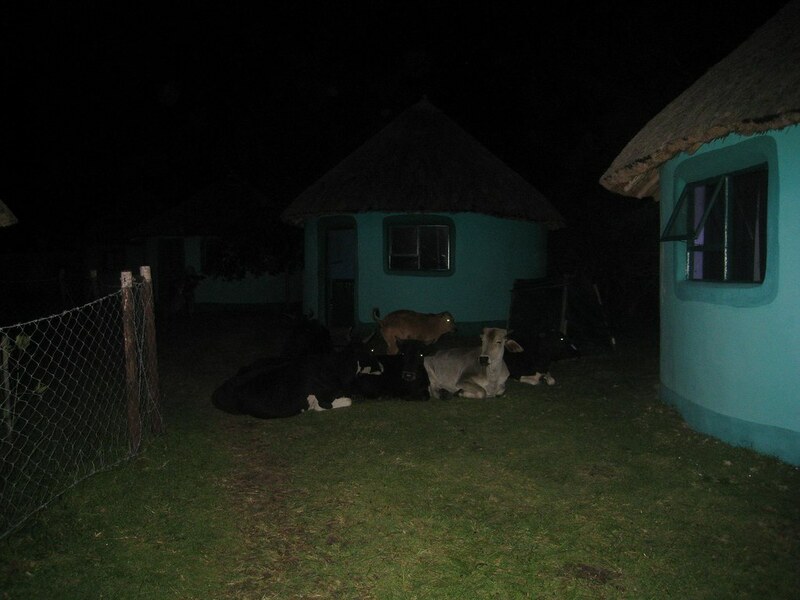 Don't be surprised if you find a bunch of cows lounging around outside your rondavel. Just be sure to watch your step the next morning, as the cows may leave a few gifts behind. If you don't have your own 4x4 transportation, it's best to arrange a pick-up and drop-off schedule with the Lodge. Expect a bumpy ride in the back of their 4x4. 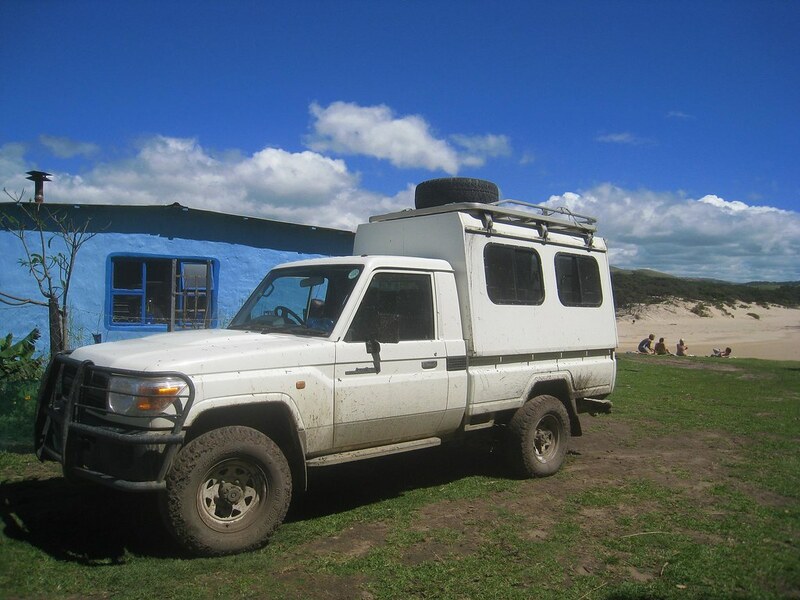 Read more about my experiences traveling to Bulungula, experiencing the lodge, and going on the Xhosa village tour. To learn more about the Lodge itself, check out their website. That actually looks quite relaxing :) I’m the biggest environmentalist that I know, and I always get skeptical about these types of places. However, this one doesn’t sound too bad. It seems like the sort of place that would be horrible if you’re not in the mood for it, but otherwise would be fun. Thanks, Dave! Hey Shawn, it was a relaxing place, and I kind of wish I’d been patient enough to spend more than 2 nights there. On the drive in, I was lucky to meet a young French couple who were great company. Later on my trip, I stayed with them in Bordeaux. The colors of this lodge are awesome! I’d love to stay somewhere that looks like a rainbow. Joanna, funny you mention a rainbow, because I actually saw a big one during my stay. Here’s the photo! What a cool place!! Would definitely like to stay here or somewhere like this one day. Quite a change from the typical backpackers hostels you find in Europe huh? Hi Annie! On the whole, I found the hostels in South Africa to have more character and higher quality than just about anywhere else I’ve been. And certainly cheaper than Europe! Theresa, sorry to hear you missed your first chance at Bulungula. It’s a special spot. I had a wonderful time on the village tour and wish I wasn’t in so much of a rush to hit the next destination. I reached Coffee Bay and ended up only staying a day there because I wasn’t really digging it. in your opinion what bow manufacture has grown the most. Try to be as unbias as possable and explain your anwser. i know there are many way to look at this, so since i am creating this post i should anwser first. In my opinion i believe that Mathew’s has made the biggest leap, not because of the popularity but because of the devoted following they have for example i work in a archery shop on saturdays that sells arrows on line, costumers are willing to pay up to 40 dollars more for a half dozen arrows because of mathews wrap on them.